Not only did the clothes look sloppy, but they also interfered in the kitchen. “Your shirts are dropping into the work you are doing, your pants are dragging on the floor and you are tripping,” she said. Since becoming the standard in 19th-century France, the traditional chef outfit has been the formal and fussy ensemble known as chef’s whites: long-sleeved, snug jackets with a double row of buttons down the front. Though technically anyone could be a chef, the outfits were originally designed for men. But in recent years, many restaurant owners and chefs have embraced a new aesthetic in professional kitchens that is less hierarchical, more comfortable and inclusive of bodies of all shapes, sizes and genders. As the culinary world distances itself from a boys’ club mentality — most recently because of the #MeToo movement — so have kitchen-wear companies like Hedley & Bennett, Tilit and Polka Pants, which design clothes that are both comfortable and stylish. All three were founded by former cooks nearly six years ago to combat their growing frustrations with kitchen uniforms. Both Hedley & Bennett, in Los Angeles, and Tilit, in New York City, stock all their styles in separate sizing and cuts for men and women to accommodate a variety of figures. “Offering a women’s XS all the way up to a men’s 4XL was a no-brainer for us,” said Alex McCrery, who founded Tilit with his wife, Jenny Goodman. Ellen Bennett, a founder of Hedley & Bennett, said she created products like her “Big” apron line to fit many body sizes. At Cafe Altro Paradiso and Flora Bar in Manhattan, Ms. Pickowicz’s solution was a baggy white short-sleeve shirt with a single row of buttons or snaps down the middle. Known as a dishwasher shirt, the uniform was once solely associated with people who did the dirty work in restaurants: cleaning, hauling and washing. Danny Bowien, the influential chef of Mission Chinese Food in Manhattan and Brooklyn, started wearing dishwasher shirts in the kitchen a decade ago. 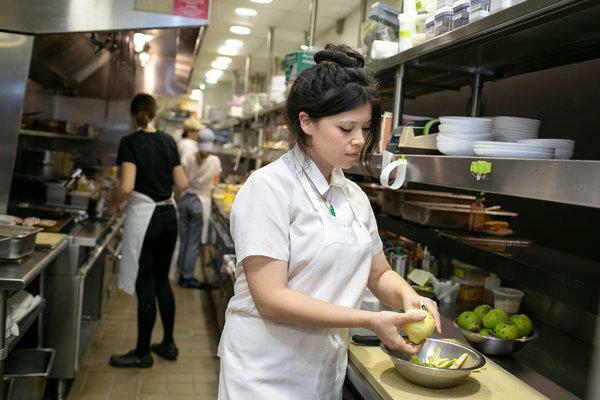 At Kismet, in Los Angeles, most of the staff prefer the coolness and mobility of those shirts, which are also cost-effective for Sara Kramer, the chef and an owner. Ms. Kramer also keeps white and black T-shirts, jeans and breezy short-sleeve chef jackets in rotation. “I’ll even wear overalls or something totally un-cheffy,” she said. The chef Dominique Crenn, who recently became the first woman in the United States to receive three Michelin stars, often rejects formality altogether, and cooks in street clothes and an apron at her restaurants Atelier Crenn and Bar Crenn in San Francisco. The exact origins of the classic chef’s uniform are murky. Amy Trubek, a professor at the University of Vermont and the author of “Haute Cuisine: How the French Invented the Culinary Profession,” said the outfits were white, like the uniforms of many other professions in the 1800s, because they represented “the 19th-century idea of purity, sanitation and cleanliness.” Even though the clothes — now typically made from stiff, sweaty polyester — were not the pinnacle of comfort or practicality, they remained the standard for nearly two centuries. Armed with a fashion degree, Ms. Thompson started sewing her own pants, which were high-waisted and figure-flattering. She now sells that design in two lengths to accommodate women of all heights. But why did the shift away from formal, uncomfortable whites not occur, say, two decades ago? Ms. Thompson attributes it largely to the recent rise of the open kitchen. Chefs are no longer hidden from the dining room, toiling away at their craft. In many restaurants, the back-of-house staff is almost as visible as the front-of-house staff, with some cooks even delivering dishes to tables themselves. Ms. Goodman said the role of the chef became more prominent thanks to the rise of the chef-as-celebrity, Instagram and food television. Ms. Bennett said that she has seen a “shift in mentality” in which people are realizing the importance of the kitchen staff, and this pride translates to better uniforms. Ms. Trubek put it another way: “It’s the end of French hegemony.” As more kitchens abandon the dynamics of their formal French forebears, it only makes sense that the uniform would follow suit.